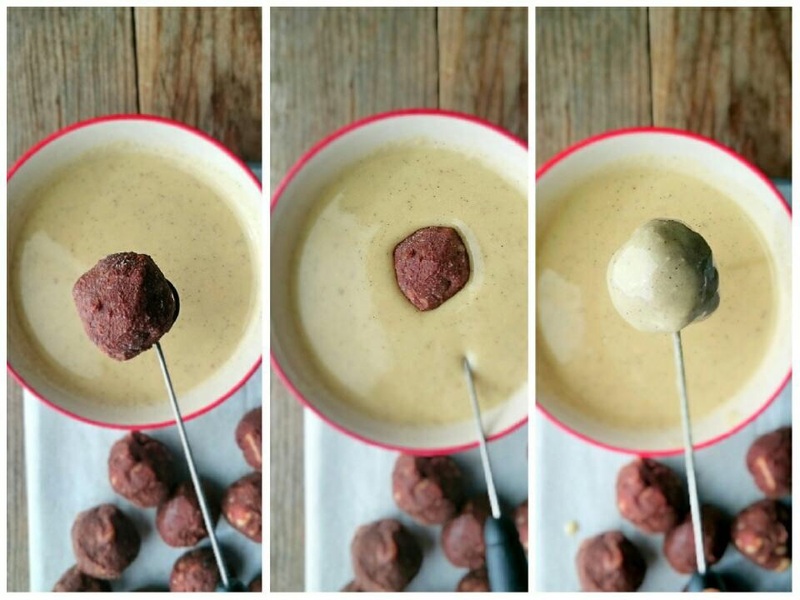 Vegan macadamia Ferrero style truffle with white chocolate. We can deny that the brands selling sweet products are very clever. They know how to make products which will taste good to everyone (although on the other hand they are all guilty of ruining our palate little by little). They want you to say, “oh my god, this is so good!” and eat half a jar….It uses (it used) to happen to me withnutella, ice creams and filled chocolates. They are definitely a big temptation, because they are made in such a way that absolutely everybody loves them. The Ferrero Rocher chocolates, for example,or nutella have a sweet balance (of a very high level) which contrasts perfectly with a percentage of salt, and all of that, offering a perfect texture whit the fat content. They are looking to make a product able to captivate absolutely everyone. It doesn´t matter if the ingredients are not healthy, what is important to them is to create a product which everyone will like to get the highest sales figures. But don´t worry, there are other fats and sugars we can use in the same way to make our own healthier version, even though that doesn´t mean you can eat all of them at once …. The cocoa butter is essential for this recipe. It is the fat of the chocolate. Its texture and sweet taste play an important role in the final texture. . It is cream in colour and comes in solid blocks, which melt when heated in a double boiler. It is important to chop it so that it takes less to become liquid. It has many properties and it is perfect to make face creams because it is super moisturizing…but that is a completely different story! The recipe is very easy to make. 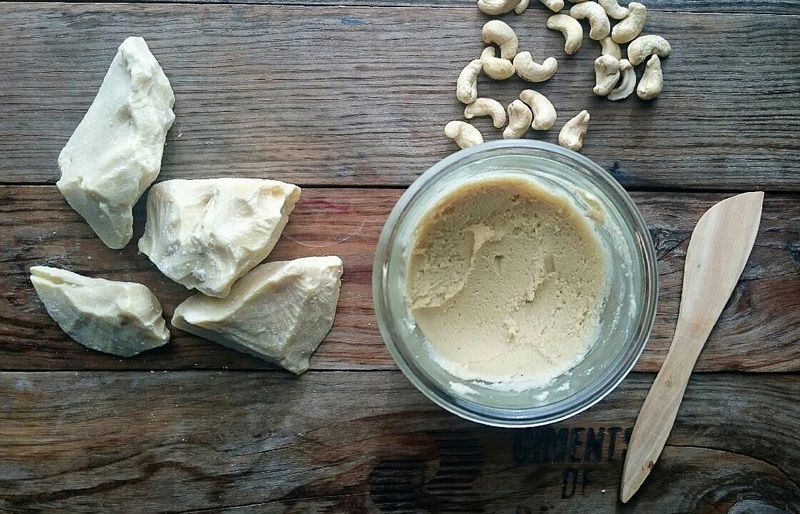 But obviously you will need to have ready the macadamia and cashew butter, and I would advise you to make them by yourself (you can use only cashews if you want to make it simple). You can do this quite in advance and keep them in the fridge until you need them. You can find the recipe here. I must admit that the nuts are expensive, but as New Year is getting closer, I thought of something special and wanted to include something more “luxurious” in the ingredients list. 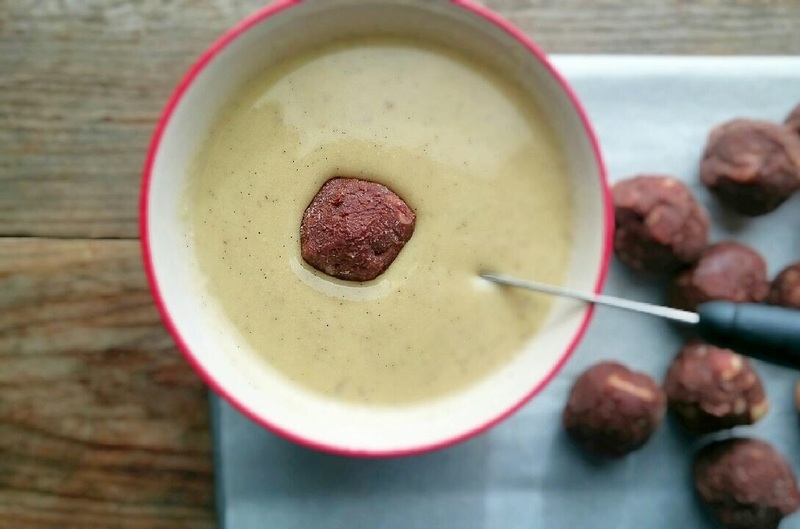 As the macadamia butter which fills the truffle is sweet, it also helps low the sugar levels. But you could always replace them with another type of nuts using instead hazelnuts for example, and following the original recipe, although it might be necessary to increase the proportion of coconut sugar and coconut oil. And what to say about the white chocolate coating!!!! I really like this recipe because it is very easy, and besides, it is made with healthy and nutritional ingredients! We should celebrate it! It is a recipe to keep forever in the notebook of the important recipes. Now you only need to begin working on it and get ready to captivate your guests with something healthier, but also with an exceptional taste! 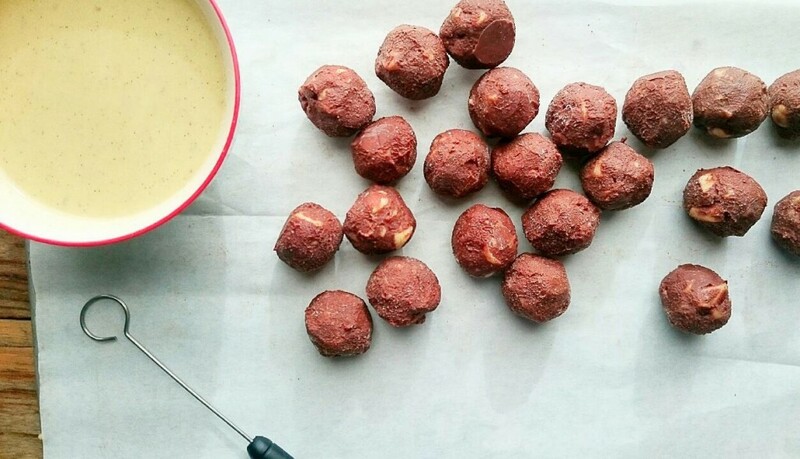 For the truffle, melt the cocoa butter and the coconut oil in a double boiler. In the meantime, melt in a medium bowl with a kitchen stick the cocoa together with the maple syrup, the salt and the coconut sugar. The mix should be homogenous and have a uniform consistency. Chop the macadamia nuts and put them aside. Once the fats are melted, add the macadamia butter away from the heat and stir well until blending with the rest of ingredients. Then pour out everything over the cocoa bowl. Add the chopped nuts and mix until they are well distributed. Put the bowl inside the fridge for half an hour. Grab an oven tray or an oven platter and put a parchment paper over it. 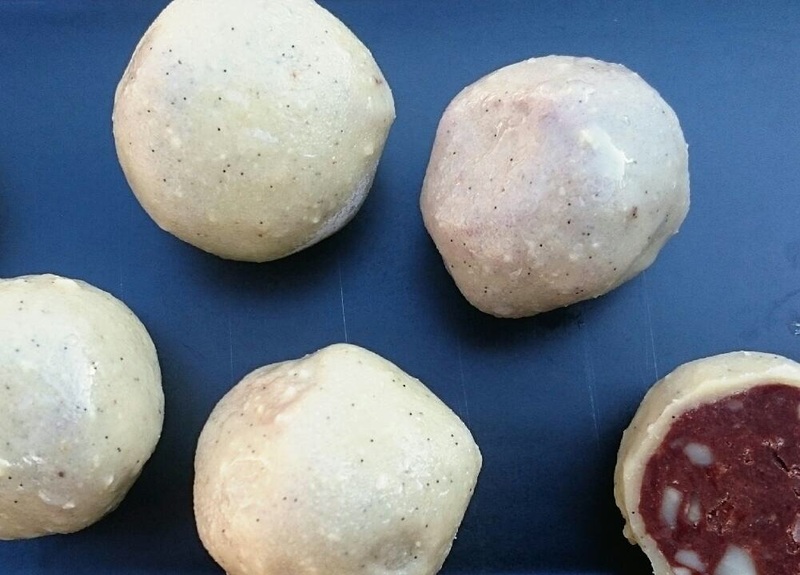 Take the bowl out of the fridge and start making small balls (they don´t need to be perfectly round). Let it stand in the freezer for an hour. In the meantime, make the white chocolate coating melting in a bowl the cocoa butter in a double boiler. Once it is melted, add the cashews butter, the honey and the vanilla (previously you will have opened it to remove the seeds). Stir well and put again the bowl over the pot (this one will still have hot water) but without turning on the fire. 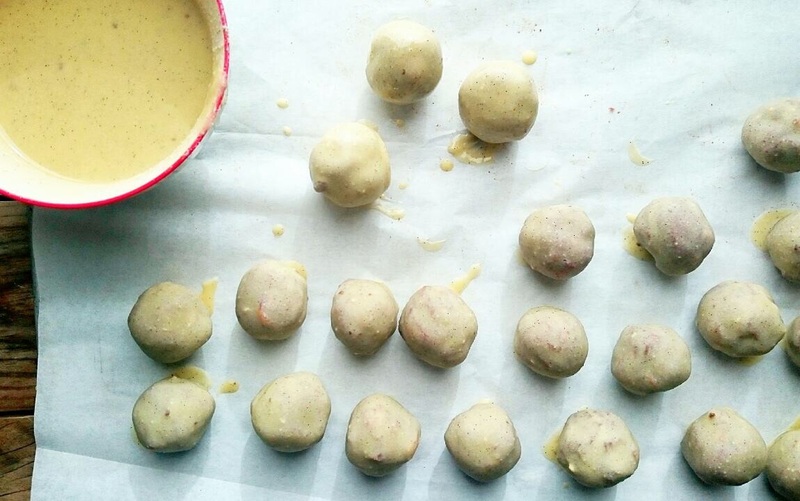 Take the truffles out of the freezer and coat them one by one with the help of a fork. I would advise you to coat them twice in this way: coat them one time, then freeze them again for 5 minutes and after, coat them again. During those 5 minutes you will need to wait, you can turn on the fire to ensure that the chocolate coating is completely liquid. Keep them in the freezer once you are done with them.